Some platforms are more focused on reducing transaction costs, like Uber, while others actually provide the underlying infrastructure that enables their users to create. Examples of the latter include development platforms like iOS and Android as well as content platforms like Medium (a platform where anyone can post articles or blog posts) and YouTube. Each of these platform types provides the tools and infrastructure for producers to create software, written content, videos, or code, respectively. Contrast these platforms with platforms like Alibaba, Uber, and Airbnb, which are much more focused on facilitating a direct exchange, and you’ll see the difference. The key difference is between platforms that provide value primarily by optimizing exchanges directly between a consumer and a producer and platforms that generate value by enabling producers to create complementary products and broadcast or distribute them to a large audience. We call this first category exchange platforms. And we call the second category maker platforms. Although both categories share the same underlying platform business model, there are very basic differences in how exchange and maker platforms function. One of the key differences has to do with a concept called matching intention. The matching intention is the maximum number of units of an item that a producer can exchange at a given time. Let’s look at a product marketplace, such as eBay. A seller is trying to sell one item. Once that auction ends, the item can’t then be bought by another buyer. A seller may have multiple copies of an item (e.g., they might be selling five copies of the same T-shirt), but the matching intention for each unit of inventory still is 1. For an Uber driver, the matching intention is similar: He wants to give a ride to one passenger at a given time. He might be able to give multiple rides over the course of an hour. But when he is looking for a rider at a given moment, he is looking to be matched with one passenger or group of passengers. Once a single passenger books a driver, that driver is no longer available on the platform at that time. So the matching intention for a driver is 1. The value of a producer’s matching intention can vary depending on the type of interaction involved. But for exchange platforms, that matching intention always has a limited, discrete value. Expressed as a ratio, a producer’s matching intention on an exchange platform is 1: 1 or at most 1: few. A three-way Skype conversation is an example where the matching intention of the person making a call would be 1: 2. However, the matching intention of a person making a Skype call still is limited by the number of people he or she feasibly can communicate with at a given time. Maker platforms don’t have this same limitation. The matching intention for a producer on a maker platform is, theoretically, infinite. Any number of people can consume the same YouTube video, download and use the same app, or read the same article on Medium. The producer publishes an app or a piece of content and broadcasts it to an audience. In these cases, the matching intention is 1: ∞, or at least 1: Many. Contrast a live stream on Twitch (a content platform where you can watch other users play video games) with the Skype example. The person broadcasting to an audience on Twitch doesn’t communicate in a 1: 1 manner with every person watching the stream. Rather the person is broadcasting out to a large group of people who are viewing the stream. 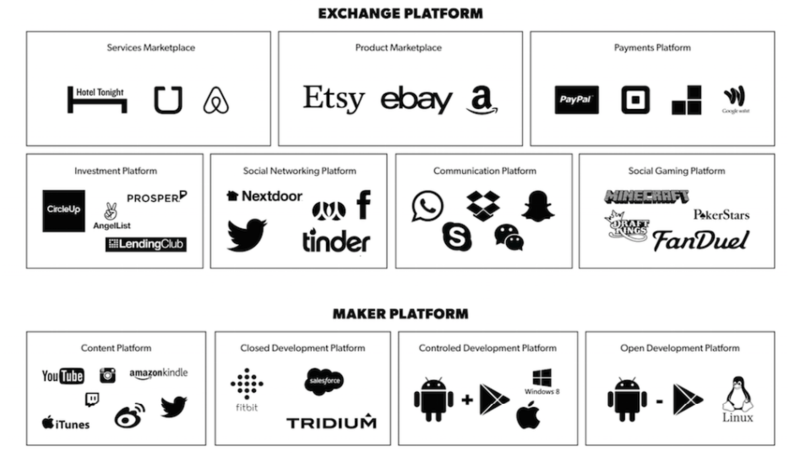 Another way to think about this dynamic is that exchange platforms have limited inventory— only a certain number of people can consume the platform’s available inventory at a given time— while maker platforms do not. For example, as noted previously, any number of people can consume the same piece of content on YouTube at the same time. Assuming YouTube’s servers could handle it, every person on Earth could watch the same YouTube video at the same time. But only so many people can take a specific ride using Uber or rent out a single apartment at a given time on Airbnb. Within exchange and maker, we’ve broken down platforms into distinct types Each type has a core transaction built around a particular type of value being exchanged. Platforms within each type often operate very similarly – even across industries, a trend that became obvious when we were building our database of platform companies. Each of different platform types requires a unique approach to platform design. Although all platforms are focused on connecting consumers and producers, which category your platform falls under fundamentally alters the core value you will try to deliver. This choice translates into very different core transaction paradigms and dictates how you design your platform. The core transaction is just one example of why a platform’s type matters for platform design. Your platform’s type also influences how you design and deliver on its four core functions. For example, each core transaction paradigm requires radically different matchmaking strategies or rules and standards. Which category your platform falls under also influences your audience-building strategy. Exchange platforms, such as Uber and Alibaba, need to focus on building liquid marketplaces that have sufficient overlap of supply and demand. Maker platforms, such as Android and YouTube, are more focused on organically building “stars” who, because of their high matching intention, can act as powerful nodes in these networks. Many maker platforms want existing celebrities to join and bring their fans with them; however, when the platform can create its own celebrities due to the network effects within its network, you know it’s reached critical mass. YouTube’s PewDiePie, Instagram’s Dan Bilzerian, and Vine’s Nash Grier are all examples of normal producers who rose to fame by building huge organic followings on their respective platforms. As you can see, understanding a platform’s type has a big impact on how you design its core transaction and four functions. That’s why figuring out which platform type a business fits into should always be one of the first steps in designing a platform.